Image caption Architect Peter Deakins was horrified to see the burnt remains of Grenfell Tower. 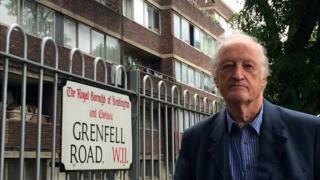 Peter Deakins drew up the master plan for the Grenfell estate in the mid 1960s, a scheme that was hailed at the time as a "spectacular surprise" by the Architects' Journal because of its scale and ambition. He was horrified to see its centrepiece, the tower, burnt out. "I really can't get to grips with it," he told me. "It's too terrible to think about. And compared to all the high hopes when we started doing it all... it's just too horrible." When plans were drawn up, more than 50 years ago, he said the area had been very rundown - the houses overcrowded, the gardens just mud, very often full of mattresses, no trees to be seen or planting. "It was Steptoe and Son territory," he recalled. "Some of it was actually filmed round here." The aim of the scheme was to build better homes. Much of the housing was low-rise, but he says it was thought logical to include a tower block, with shops and offices on a lower deck. As it would have lifts, the Ministry of Housing would contribute to the cost. Although Peter Deakins was not the designer of the individual buildings on the Lancaster West estate - which includes Grenfell Tower - he worked on the estate as a whole and as an architect on many others, including the now-listed Golden Lane council estate and the Barbican. In those days, he says, the process was more closely overseen, which may help explain why the tower is still standing, despite the fierce fire that raged through it. "It's a very solid building underneath, and would stand up to pretty well anything, I would think. "The way buildings were detailed, there was so much control, there were so many fire officers involved, and building regulations under the London Building Acts - it was far more strict." Today many contracts are so-called "design and build". The architects will draw up the design, but hand over to the builder or developer once the project has been approved by the local authority planners. Contractors will often take over the detailed design, meaning they will be responsible for compliance with regulations, and they will have a building control officer, who can either be employed by the local authority or work independently. Contractors are responsible for assessing fire risk, instead of the old system where the local authority would inspect and provide a fire certificate. The Royal Institute of British Architects (Riba) has highlighted the potential risk of this approach, and has also raised concerns about the virtual disappearance of the "site architect", who used to oversee the construction, and the "clerk of works" who would be based on the building site and check the work done. At the time Grenfell Tower was built, Peter Deakins recalls, the job of site architect was often extremely hard work. "The architect in those days was chairman at site meetings and totally responsible for everything that happened," he explains. Building sites can be dangerous places: he knew of one architect killed in an accident. But he does believe that architects should once again play a more central role and see the whole process through. Looking up at the tower, its concrete skeleton visible beneath the blackened, blistered remnants of the cladding and insulation, Peter Deakins mused that it might be strong enough to be restored. But he paused, acknowledging that many people would much rather it came down. "I wouldn't agree with people who say that all towers should come down. It's a bit like saying blue is better than green. But in this case, you just have to look at it. It's horrific."